One thing which is missing big-time from the iPhone is the ability to copy/save contacts to and from the SIM card. But again as they say: ‘on the iPhone, there is an app for just about anything’. And so finally, there is one to take care of this problem as well for the jailbroken iPhones. 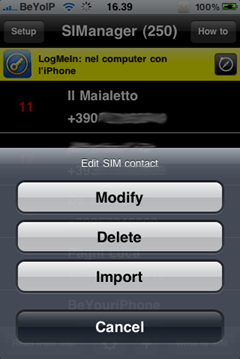 In the latest version of Giovanni Chiappini’s SIManager, there is now an option with which we can copy all contacts from iPhone to the SIM card and vice versa. Maximum number of contacts that you can save in SIM is fixed, and the count appears at the top, next to the name of the application. Contacts that are imported into the iPhone, can be modified right from your iPhone with all the options from the native Contacts app. Likewise, you can also delete all the contacts from the SIM card by simply tapping a button. These changes are visible in SIManager in different colors codes. Black color indicates contact imported from the SIM. Red color indicates contact has been eliminated. Dark Red color indicates contact was changed. SIManager is still in Beta so expect it to have a few bugs here and there. You can go ahead and try this app by adding this repo in Cydia http://test.beyouriphone.com. You’ll need to have a jailbroken iPhone to get this to work. Follow our step by step guide posted here to jailbreak your iPhone if you haven’t already. To be on the safe side, make sure you backup your contacts manually before trying the app. Simply SSH into your device and navigate to /private/var/mobile/Library and then backup “AddressBook”. Alternatively, you can also backup your contacts by syncing your iPhone with iTunes. You can follow us on twitter or join our facebook fanpage to keep yourself updated on all the latest iPhone App releases. Yeah, so how does one get to a URL in cydia? I also typed it on my PC & got the http 403 forbidden message. Open CYDIA, go to SOURCES and then ADD the URL. Thanks, never knew that I did find that it's a bit more involved than that. Open Cydia, on the bottom: Manage, Sources, upper right: Edit, upper left: Add, type in url, Add Source, Done, install, exit Cydia. Empty SIM card function does not work yet. the repo doesnt work for me ive tried adding it over and over exactly as it is is shown. instead of “test” do you type “cydia”? tried but seems is empty there. url dosent work is there a new link?